There are several good forums on parenting with SCI, as well as information on parenting tips for looking after children with SCI. CareCure has a forum called ‘Family’ which has tips on parenting from a wheelchair, caring for children with SCI, divorce and child custody, pregnancy, fertility and IVF. This site also has instructions on how to try insemination at home if you can ejaculate. We would like you to share your stories and tips on parenting with SCI. Please contact us and send us your story with a photo if possible. We hope that this will show people with recent SCI and their families that almost anything is possible with a bit of creative thinking! 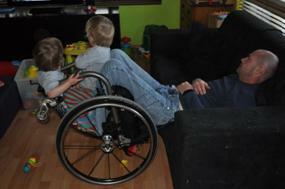 After many years following his accident Anton married, and is now a proud father of twin boys. When the boys were babies Anton was the ‘stay at home’ Dad several days a week and cared for the two kids by himself. Anton’s tip, don’t put babies in babygro suits with press studs down the front, they come undone when you grab the back to lift the baby up. Also, as you can see, the net under a wheelchair makes a great playpen when you want toddlers to stay in one place for 5 minutes! Craig married after his accident, and is father to a gorgeous daughter who is now a teenager. When his daughter was a baby he was often expected to look after her on his own so that his wife could have time out. As Craig does not have good hand function he dressed the baby in dungarees with straps so that he could slip his hand under the straps to lift her in and out of the baby capsule. Symon married after his accident and now has two children. 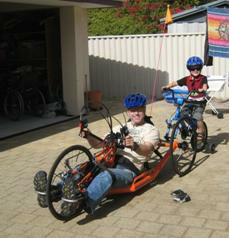 To be able to combine a bit of exercise with spending time with his son, Symon had his handbike modified (by Matt at RAM wheelchairs‎) so that his son could ride behind him. 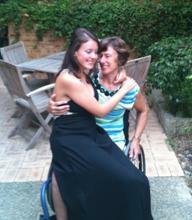 Louise had three teenage children at the time of her accident. 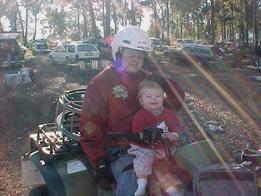 Louise was still able to teach her youngest daughter to drive a manual car and supervise her for the hours in her logbook.